This rooster is a bit of an arrogant one - look at him standing so proudly with his tail feathers held high! He's all set to rule the roost. 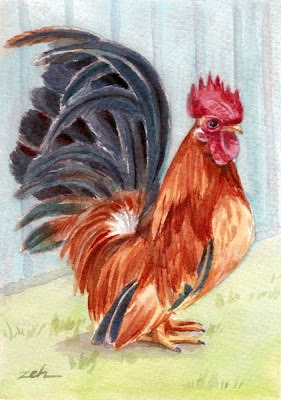 Lovely rooster! I'm finding feathers extremely difficult to do at the moment, so have set it as a priority for the next few weeks. Lovely paintings and lovely blog.